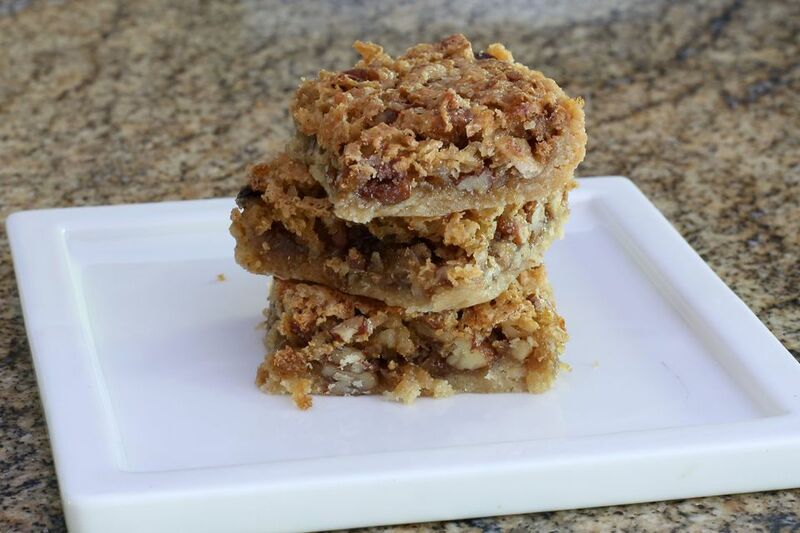 These chewy coconut dream bars are baked in two stages. First, the brown sugar shortbread crust is partially baked and then the chewy, toffee-like coconut and pecan topping is added and baked. I used chopped pecans on the bars pictured, but walnuts may be used. Semisweet or milk chocolate chips are an excellent addition to the topping, but they're optional. These remind me of magic cookie bars, but with a shortbread crust. Take them to a party or potluck, or make them a weekend treat for the family. In a mixing bowl with an electric mixer, beat the butter with 1/2 cup of brown sugar and 1 1/4 cups of flour until the mixture begins to hold together. Press into a 9-by-13-by-2-inch baking pan. Bake for 15 minutes. Let the crust cool for 15 to 20 minutes. In a mixing bowl with an electric mixer, beat the eggs with 1 cup brown sugar, vanilla, 2 tablespoons flour, and baking powder until smooth. Stir in coconut, nuts, and chocolate chips, if using. Spread the filling over the crust and bake for 20 minutes longer, or until the topping is golden brown. For a thicker shortbread crust, use 1 1/2 cups of flour, 2/3 cup of brown sugar, and 10 tablespoons of softened butter.